Special...I hear that word a whole lot! Mommy says I'm special because of my "uniqueness." Daddy says I'm special because of all the silly things I do...Well, I was home with Daddy the other day, hangin' out and watching some of my favorite television. I went to get a cold drink of water and torment Daddy with my jowl juice (I love that game, and he'll never figure out that I leak jowl juice on purpose...hehehehehe...). As I walked away form the water dish, I saw my Daddy run in with the ever-so-delicious towel. 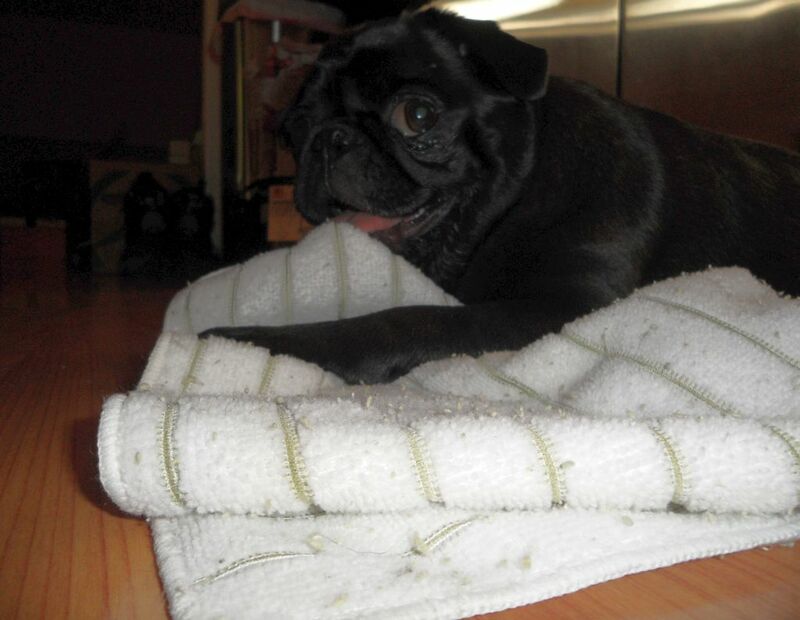 And, being the rambunctious pug that I am, proceeded to attack the towel in one of my favorite games. Usually he starts moaning and groaning in a vein attempt to get me to stop chewing on the towel. This time, he started laughing and said I'm even more special....I'm a Lefty!? Seems that I like to grab and paw with my left paw. I didn't think that was a big deal, but Daddy (and eventually Mommy) thought it was a big deal! So I got all excited and with my cuteness and orbs managed to get Daddy to gimmie the towel. He then snapped the pic! I knew he was up to something...He never willingly gives up the towel. Luckily I was looking my best at the time! So, I guess I have another special thingy...being a Lefty! Oh Belly Buttons!! Such great special news!! Lefts are sooo special!! Mommy's Grandpaw was a pitcher for the minor leagues and they called him south paw because he was left handed!! Daddy's Mommy (my grammy) is left handed too!! They have a special store for left handers in a couple towns over from wheres Mommy and Daddy lives!! Special Stuffs 'deres!! Maybe 'day have special toys for a cool cute Bella!! Oh's we's also love your cute picture too!! Now which paw do you wears your watch ons???? so cool of your pawrents to be so in tuned wits 'dere little Belly Buttons!! 'Day really LOVE YOUS!!!!! Oh, you are a special girl no doubt. Mom says I am special too when I do things like run into the doorway b/c I am not paying attention. Want to ride the short bus together? Really you are a lefty...now I gots to figures out what paw I likes best. I want to be a lefty like you, you are so fun and cute!